I was at WGHS from 2005-2012. I was in Stafford House and I was Drama Captain in sixth form. I took Biology, Chemistry, English Literature at A level (getting a D, C and B respectively) and I also took Maths at AS (C). I then went to Aberystwyth University to study for a BSc in Zoology, getting a 2:2. They weren't the best grades in the school but they were good, and have never held me back. I never really knew what I wanted to do even towards the end of university - I just did what I enjoyed. The food and FMCG (fast moving consumer goods) sector is always looking for capable individuals to recruit, not usually caring about your degree choice, so, after University I ended up working at Dawn Meats - a red meat company in South Wales. It's a really exciting and fast paced environment and I love food - so that helps! It's not for everyone as it can be stressful, but for good individuals, the room for personal growth within that sector is excellent and it's very exciting as there's always something new going on. I have excelled here, as I had good problem solving skills and I was organised. 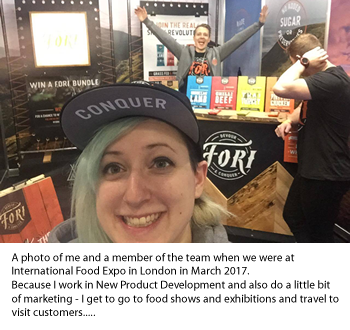 Within 20 months I've had experience launching new products, running food trials and sitting on in meeting with customers such as Marks and Spencer, Selfridges and Wholefoods. I'm now moving jobs to work in New Product Development at Douwe Egberts the coffee company in Banbury (they make Kenco, Tassimo, Maxwell house as well). Working in the food and drink industry is great. It's not for everyone as it can be stressful but the environment is exciting and the people are great and I'd highly recommend it. If you are unsure of what you want to do, consider looking into a career in Food or FMGC companies.